Here's my simple recipe for this broth that can be used as stock for your other cooking. My version done as beef ribs broth. Blanched the meat or ribs you are cooking in hot water to remove any dripping blood. Put everything into your big soup pot. Add water till it covers 5 cm above the top of your ingredients. Allow to boil and then turn down the heat to simmer. Stir ocassionally to prevent burning at the bottom. 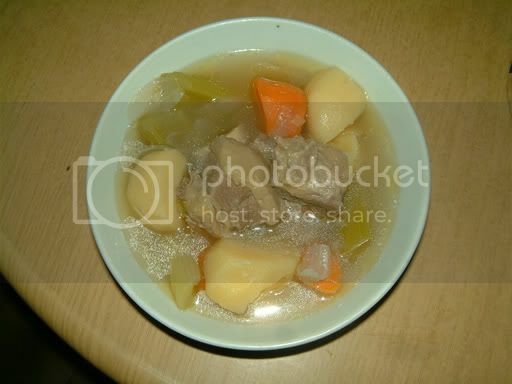 When potatoes, carrots and meat are tender, the broth is done. Flavour with salt or light soy sauce. PS: For those using it as stock, you can drain the liquid and allow it to cool. Put it in the fridge to allow the surface fats to coagulate. skim them off and you have lower fat content stock for cooking! I cooked mine in the pressure cooker, so it took less time and no stirring required.